President Abdel Fattah al-Sisi inaugurated several developmental projects today in 10th Ramadan City, Sharkia, and New Cairo. The projects included a social-residential compound in 10th Ramadan City, and a water purification station in New Cairo. Sisi also inaugurated the Dar Masr Residence in 6th of October City, playfully asking a soldier, “why are the lights open?” to which the soldier replied, “the residents don’t close them,” prompting a few laughs. The inauguration witnessed a number of key decisions and initiatives by Sisi. Most notably, Minister of Transportation Hisham Arafat asked Sisi to approve increasing the prices of train tickets from 20 to 25 percent. Sisi replied to the request that the ministry must find a way to repay its debts, pointing out that all the projects currently being carried out by the ministry are only feasible due to loans they have taken. 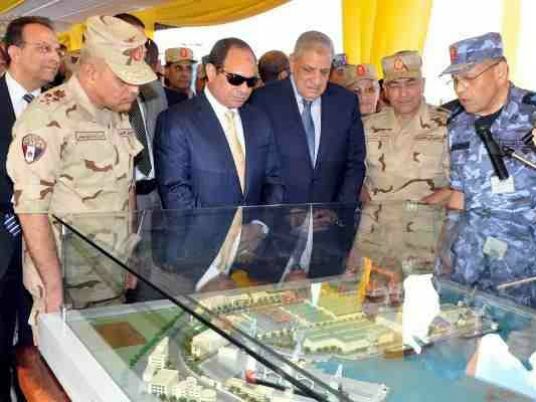 Also during the inauguration, Sisi expressed his desire to finish building 4,000 micro-, small-, and medium-sized enterprises, which will be carried out by the housing ministry and the Military Engineering Authority. “I have spoken to the Minister of Industry and informed him to authorize the military under my supervision to begin building 4,000 factories, either that or the ministry will build them,” he said. Sisi said they must be completed from six months to a year, in order to generate employment opportunities for thousands of young people. Sisi then voiced to the audience the accomplishments made in recent years. “Four years ago we spoke of a project to build a million-person residential unit in Egypt, and many people assumed we couldn’t do it.” He boasted that not only had the number been achieved, but there are also unannounced numbers of almost 200,000-250,000 units. Since the beginning of his term, Sisi has been keen to build residential projects. One notable project was the Bashayr Al Kheir in Gheit Al Enab, Alexandria, which continues to expand its residential population after its inauguration in 2016. He also built Al-Asmarat housing project in Al-Moqattam, established using the ‘Tahya Masr’ (Long Live Egypt) funds. He is eager to support housing developments in order to tackle the problem of informal settlements. The issue of informal settlements has ballooned in recent decades, but began in Egypt 1924, according Sherif Mahmoud, the former Minister of Growth. By 2015, there were over 1,800 informal settlement across the country, according to Samir Gharib, the former President of National Organization for Urban Harmony.